For years I’ve bemoaned the lack of serious, thoughtful, theologically rich lyrics in the praise songs and worship choruses I’m subjected to at church. Some of the recent praise and worship music remedies that, but I’m still occasionally struck silent by vacuous, empty lyrics using clichÃƒ©s to resonate with worshipers and the time-tested trick of singing a single chorus line over and over until we all fall into a trance-like worship state. I miss scripture in my worship. I miss theology in my worship. I miss the hymns. But what I don’t necessarily miss are the hymn’s melodies and forms. As my wife and I have discussed this, I’ve often wondered aloud why church worship directors don’t apply their musical talents to translate older hymns into contemporary sounds. Okay, maybe most church worship and music directors really aren’t that good at creating new melodies, but surely a denominational juggernaut could afford to hire somebody to update some good, solid hymns into a contemporary structure. Surely? So, we’re left with borrowing our hymnody from the twenty-something songwriters out there who have a catchy, engaging sound, but have little depth in either their life-experiences or scriptural knowledge, and thus the worship music they give to the church have little power to teach, to train our thinking, to engage our minds, and provide transformation. 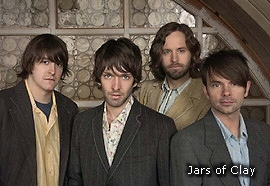 Christian pop/rock band Jars of Clay explains why the church needs more Redemption Songs. Interview by Collin Hansen | posted 10/21/2005 09:00 a.m. This sounds like a project that deserves to be on my shelf. I guess, that is, if I were still buying CDs. 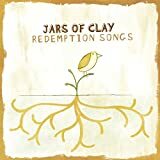 Most of my listening now is podcasts and sermons, but if I were to buy a CD, I think I’d give this one a serious shot. The interview reveals that JoC has been playing with updated versions of “Be Thou My Vision,” “And Can It Be,” and “This Is My Father’s World,” three of my favorite hymns. I agree completely. The new songs do seem to be just a weeee bit on the shallower side — though I was at a Delerious? concert Friday night and was impressed with them (hadn’t heard of them before — that happens when you are in your 40’s). Anyway — JoC have it right when they say that they old songs are about the cross. And they are about heaven alot too. Both are subjects that seem to have fallen out of favor — especially in some of the “seeker friendly” churches. I love the JoC CD and would like to suggest another one….. Hymned No. 1, by Bart Millard. WONDERFUL new twist on OLD songs. Hubristic: exaggerated pride or self-confidence. Sounds like the opposite of what praise and worship should be about. I get very frustrated with my church’s selection of the same simple songs with easy lyrics, week after week. I understand the need for keeping it simple, it’s just that there are so many good P&W songs, as well as hymns, that are left on the side. Ah well, it’s not about my personal preferences but worshiping the Lord. Good thoughts. You might also want to check out Brian McLaren’s open letter to Christian songwriters and the “unauthorized postscript”. I am an organist in a church that does contemporary praise and worship, and I am getting a lot of “attitude” from our youth director because ? go figure. I am really good at this and I’ve had people from outside come into our church and compliment me on my playing. I give the glory to God because He is in full control. I am 58 years old (look young for my age) but I still feel that there is a prejudicial attitude towards me because of my age. That stinks and I have had poor feedback via our Pastor’s wife because of complaints from the church about the overall volume of the new music. We tried everything including lowering our overall sound but there is a real legitimate problem in the church today that they can’t lay aside these weights. Church is a very cultural organization that isi really based on “grass roots” (we’re in Texas) and Texans and other southern folks are just “not reached” by the new stuff. If you have an answer to this please e-mail me! Thanx “Calamity Jane”.